Vaccines have saved millions of lives, but nobody likes getting a shot. That's why scientists are trying to develop oral vaccines for infectious diseases. To develop the oral vaccine, the researchers coated magnesium micromotors with red blood cell membranes that displayed the Staphylococcal ?-toxin, along with a layer of chitosan to help them stick to the intestinal mucus. Then, they added an enteric coating that protects drugs from the acidic conditions of the stomach. When given orally to mice, the micromotors safely passed through the stomach, and then the enteric coating dissolved, activating the motors. 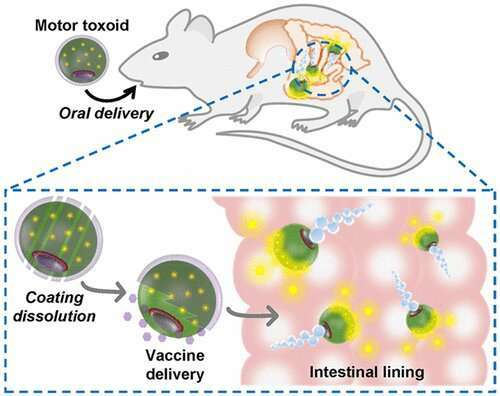 Imaging of mice that had been given the vaccine showed that the micromotors accumulated in the intestinal wall much better than non-motorized particles. The micromotors also stimulated the production of about ten times more IgA antibodies against the Staphylococcal ?-toxin than the static particles.